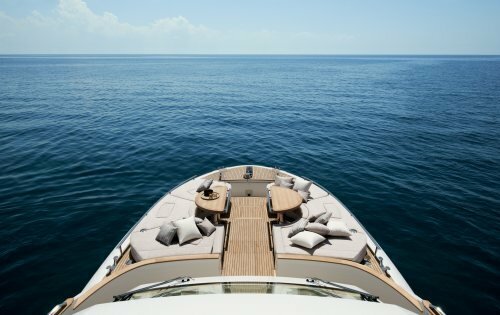 Luxury charter yacht ESMERALDA OF LONDON was designed and built by Monte Carlo Yachts in 2012 and measures 21.3m (69.9ft) in length. 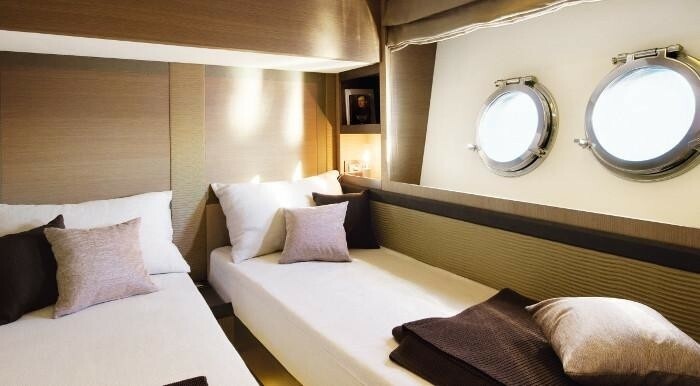 The yacht ESMERALDA OF LONDON can accommodate up to 8 charter guests in 4 en-suite cabins and is available for charter in the Mediterranean. 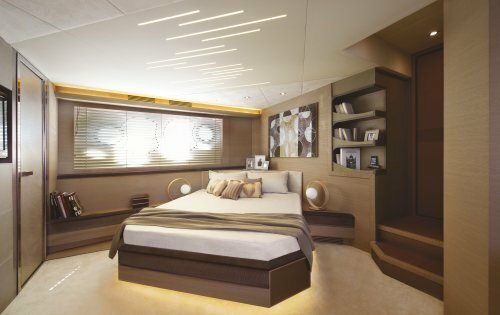 M/Y ESMERALDA OF LONDON boasts a contemporary interior of soft neutral tones throughout, creating a serene balanced atmosphere. 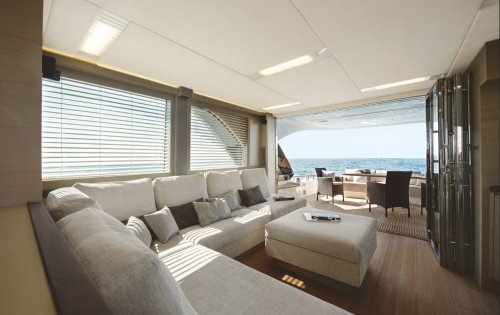 The salon and dining are an open plan with the lounge aft. 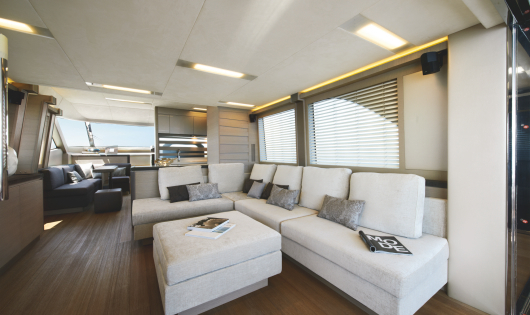 Guests can relax on the plush L shaped sofa whilst enjoying the Bose Home theatre system and 40" LED TV with Blue ray DVD. 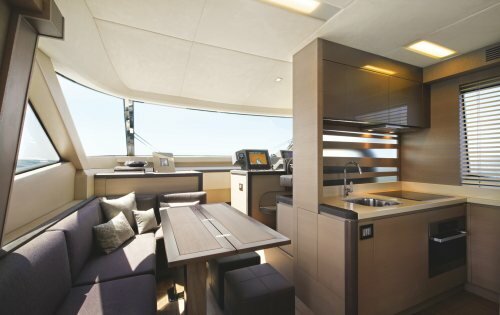 Forward, the formal dining area is adjacent to the galley and raised, taking full advantage of the scenic views. 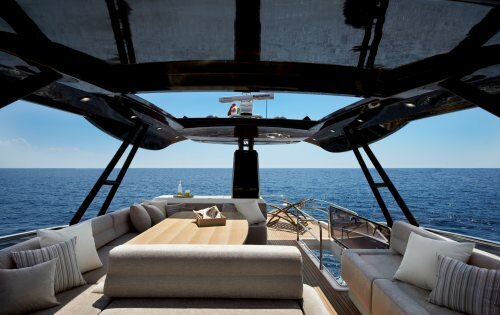 Motor yacht ESMERALDA OF LONDON has ample exterior living areas including 3 alfresco dining options. 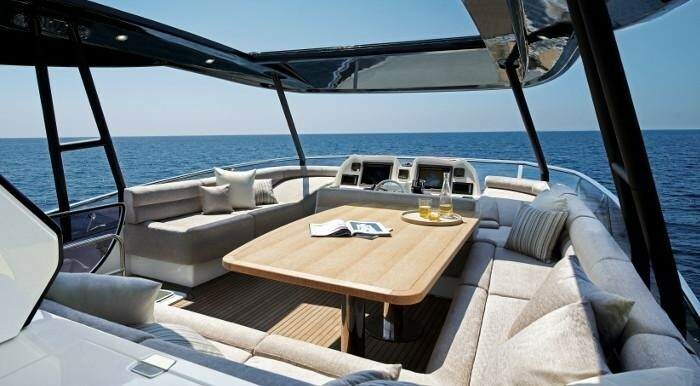 The aft deck is partially shaded with an alfresco dining option and ample seating. 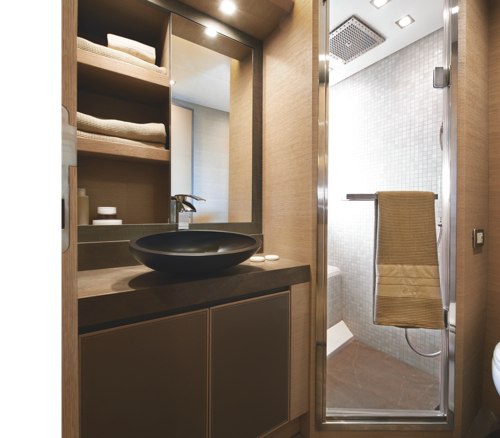 Water enthusiasts will find the lowering extended swim platform ideal for easy access to the water toys selection. 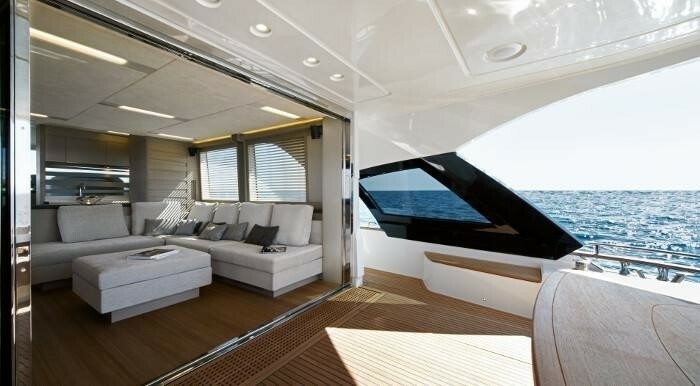 Wrap around decks lead forward to the massive foredeck, alfresco dining tables and large sunpads. 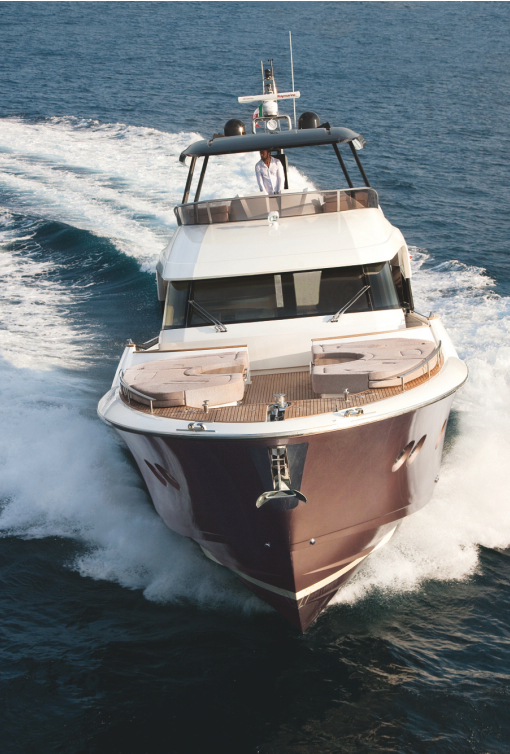 Charter yacht ESMERALDA OF LONDON offers a fabulous flybridge for entertaining. 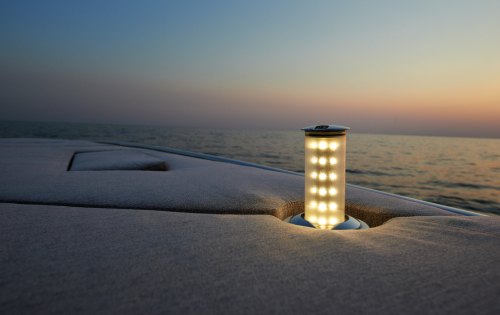 Guests may wish to dine under the stars by night or under the retractable Bimini by day. 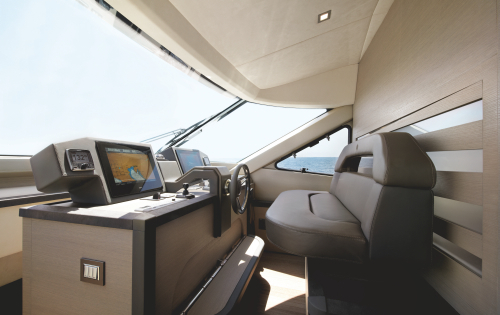 The flybridge offers plenty of additional seating and chaise lounges, perfect for all 8 guests to relax and enjoy. 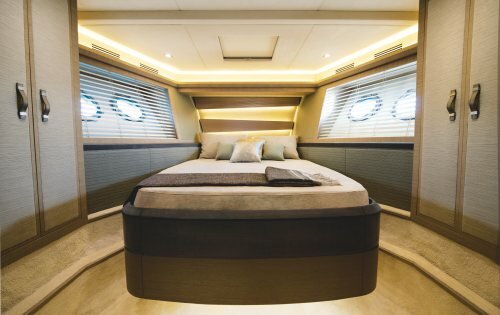 The ESMERALDA OF LONDON motor yacht boasts a unique metallic light copper toned hull with a beam of 5.42m (17.8ft) and a draft of 1.8m (5.9ft). 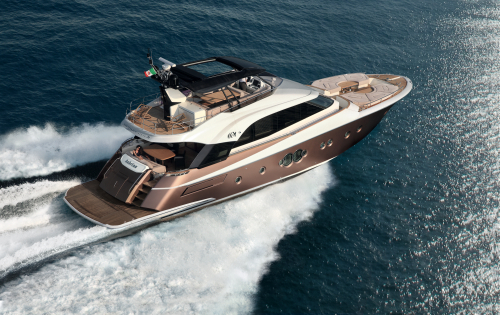 The yacht is powered by 2 MAN 1200hp engines which cruise easily at 20 knots and can reach top speeds of 30 knots. 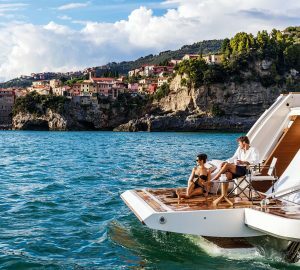 Charter yacht ESMERALDA OF LONDON is run by a professional crew of 2 to ensure a memorable and relaxing yachting holiday. 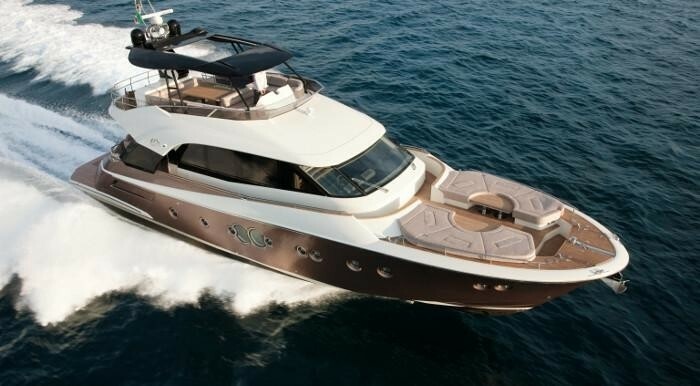 Luxury motor yacht ESMERALDA OF LONDON can accommodate 8 charter guests in 4 well-appointed cabins. 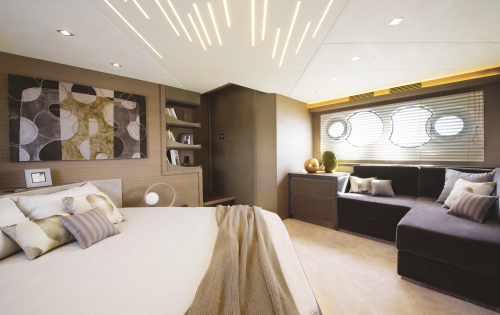 The master suite is amidships and full beam of the yacht boasting large viewing windows on port and starboard. 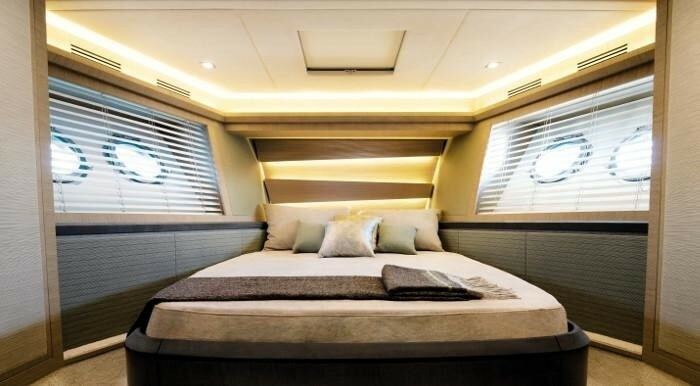 The cabin offers a queen size bed, L shaped sofa and en-suite facilities. 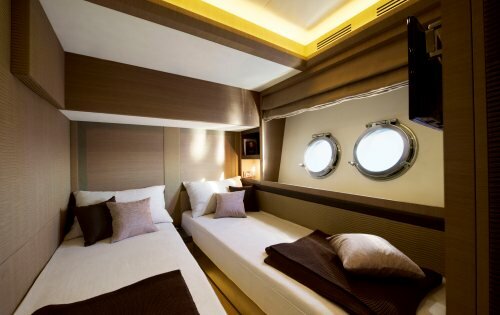 The VIP cabin has a center lined queen size bed and is forward and full beam of the yacht with en-suite facilities. 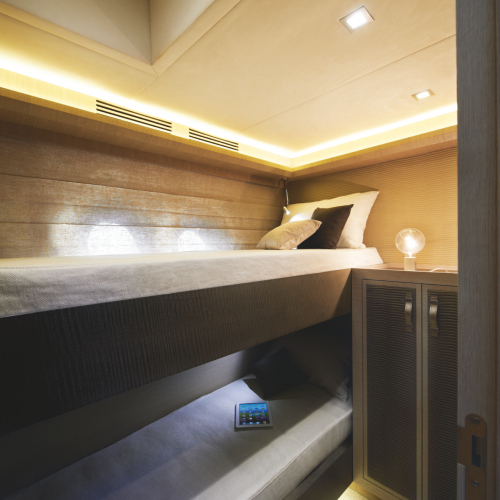 A further 2 cabins offer single beds, one with side by side beds the other with upper and lower bunks. 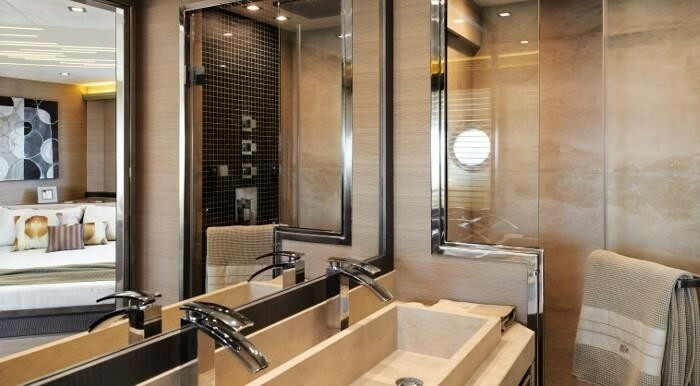 Both cabins offer en-suite facilities. 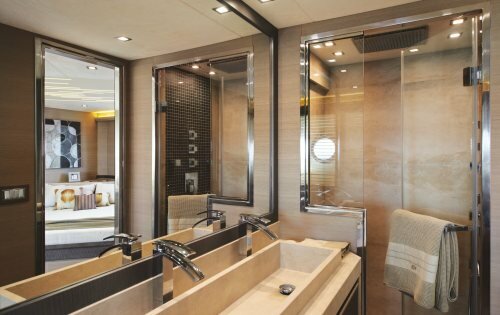 The calm neutral décor of the spacious cabins provides an elegant soothing ambiance. “There’s the pleasure derived from beauty - beautiful things alone can save us. There’s no explicit functionality which can show the way to project design related decision making. What moves everything is passion for beauty. 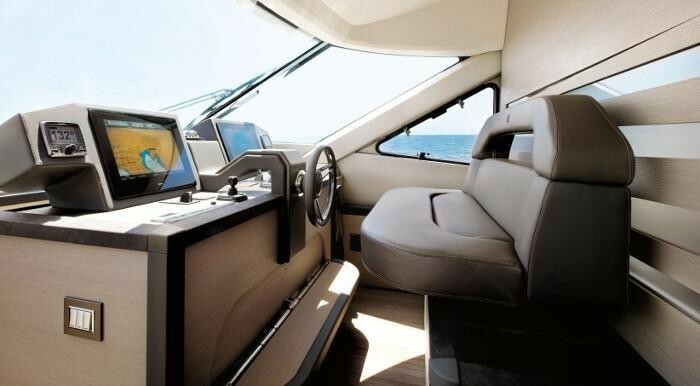 This is the sexiest thing about the boat taken as an object which really makes it very different to houses, paintings, or other forms of art. 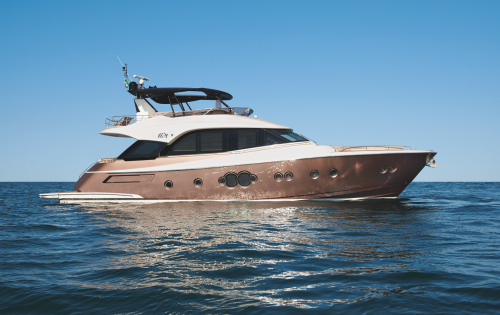 The chance to put your boat object you have fallen in love with on show for all to see. It’s a near perverted aspect of wanting to share your very own passion with someone else. 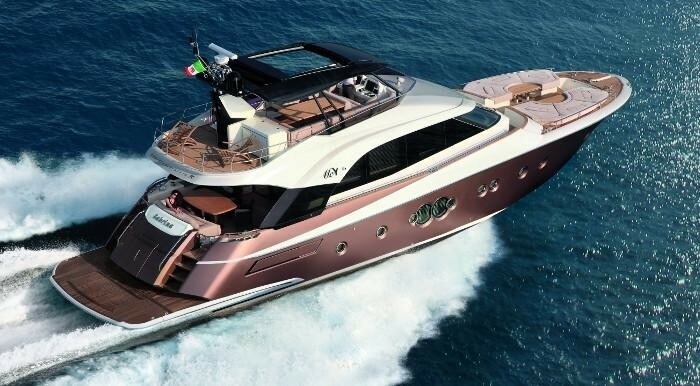 Boats can be shown off anywhere. 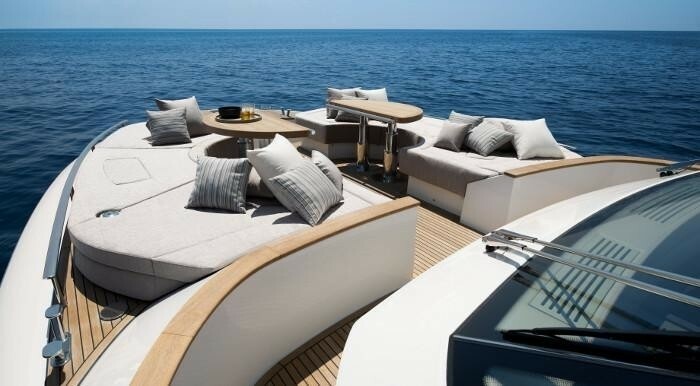 And moreover you sleep inside her, you cruise in beautiful places with her and having style you probably enjoy better interiors than you have at home. " 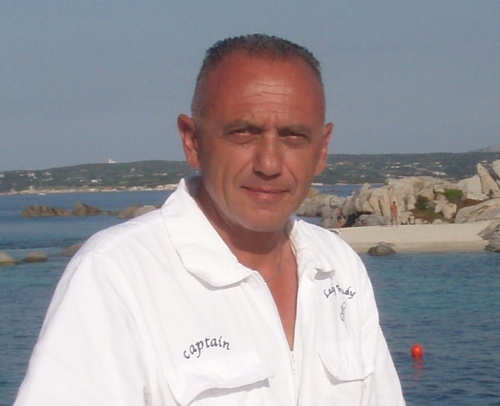 - Dan Lenard from Nuvolari – Lenard, a large, multi-award winning Italian yacht design firm.